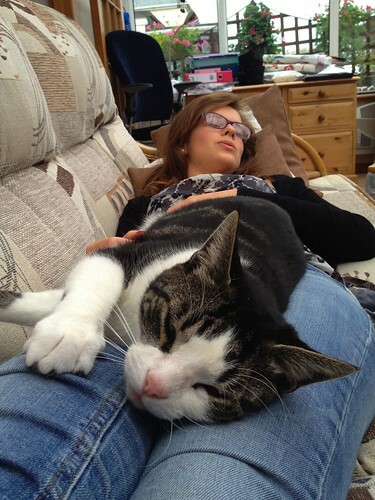 Sundays should be all about relaxing, lying on sofas and watching crap TV. Whilst The Mister and I lay on the sofas in the lounge Stef (or Pedro as I have started to call her – it suits her!) and Billy lay on the sofa in the conservatory. Perfect peace on a Sunday. First off I have to admit that I haven’t taken this photo today and I am not even sure who took it, one of my aunts or uncles I guess. My Mum and Dad have gone to London today to my cousin Mark’s wedding. He and his wife Jeannine got married in the OBE chapel at St Paul’s Cathedral. Unfortunately due to limitations on the numbers able to fit into the chapel most of the cousins were not able to attend the ceremony. The happy couple are having a party on the island next month I think so hopefully we will be able to go to that instead. 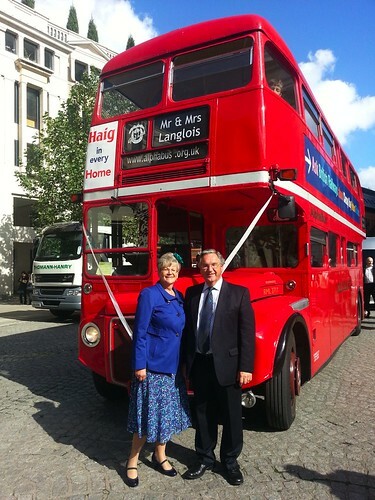 Anyway, I gather the guests travelled to the reception on a London bus and I just love this picture of Mum and Dad standing in front of it. 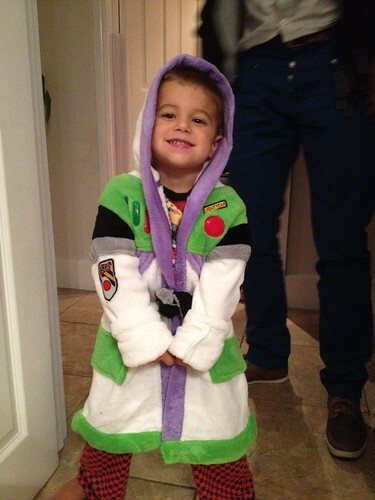 When my sister and brother-in-law went to England they bought Barnabas a very cool Buzz Lightyear dressing gown. Dad’s vegetable patch is nearing the end of the season, some things have done really well like the carrots, other things like the tomatoes have been a complete disaster. So, we are eating up the last few beans and carrots that have been coming through. Delicious! 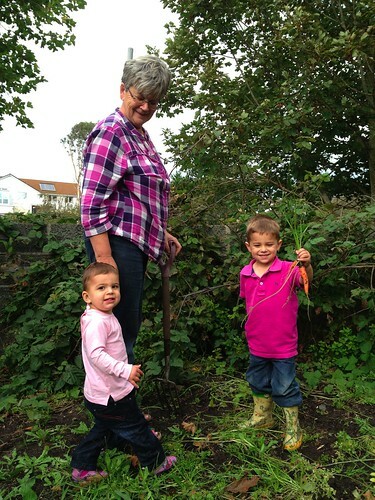 Here are Barnabas, Eden and Mum digging them up. Just as well the veggie patch is coming to the end of the season though, dad has plenty to be getting on with in our house! My sister and my brother-in-law have gone to London for the night and Mum is in charge of their kids. Unfortunately this house is full to the brim so she has had to go up to their house to sleep for the night. When The Mister and I arrived home from work she seemed quite grateful to see us to help us entertain Barnabas and Eden for a bit. 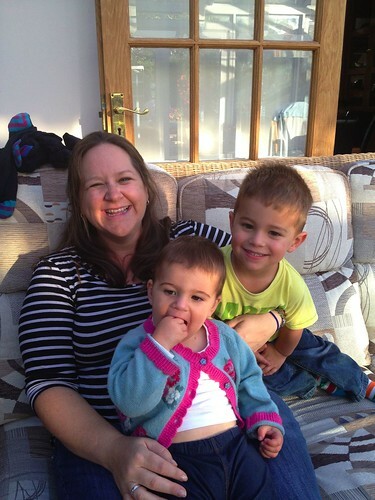 They are full of beans and great fun, and Barnabas is definitely understanding about the baby which is very sweet. It will be lovely for Winston to have big cousins to play with! The weather today has been completely unpredictable. One minute it has been glorious sunshine and then next minute it has been absolutely torrential rain. 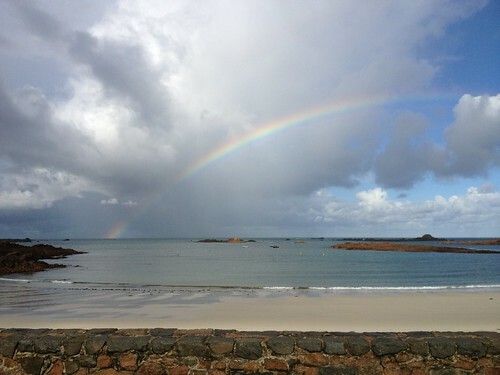 The Mister took a walk down to the post office and got caught in a shower but he did manage to capture this picture of a rainbow over Cobo Bay. A distinctly more interesting picture than any I took today as I was mostly stuck in the office! I have had a very long and busy day at work followed closely by a really hard work choir practice. We have a concert in about 3 weeks – most of us do not know the songs. Queue an evening of recording each song in at least triplicate so that each part can be hear easily and therefore learnt properly. It was hard work! 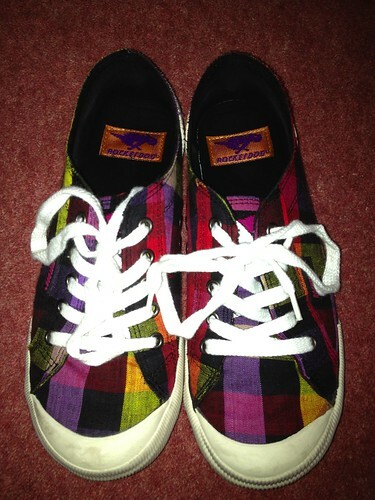 So, I needed an emergency photo of the day, and these are my lovey new shoes that I bought at the weekend. I feel stuck. I feel as though nothing is happening with the house because we are waiting for quotes and stuff to come back. I just want something to happen so that I can feel as though we are making progress. I now feel really doubtful that we will be in before Winston is born and I am really sad about that. I so wanted to be settled in our own home because I feel like we would actually have space then. I know it can’t be helped but it is a bit frustrating. So, I went to the warehouse today and picked up these seat pads for our kitchen chairs. 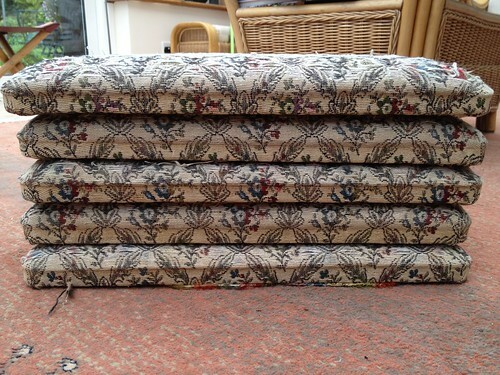 These chairs used to be in the dining room at Gran’s house and I intend to cover them with some lovely stripey fabric. I am not really going to tart the chairs up too much otherwise as they have a lovely battered quality about them! Our last day in London so we met some of my friends for lunch. For them it was an Italian meal with several bottles of wine and then we headed to Soho for a few more drinks. I seem to have done really poorly with taking photographs over the last few days. We spent so much time just wandering that I forgot about the camera! 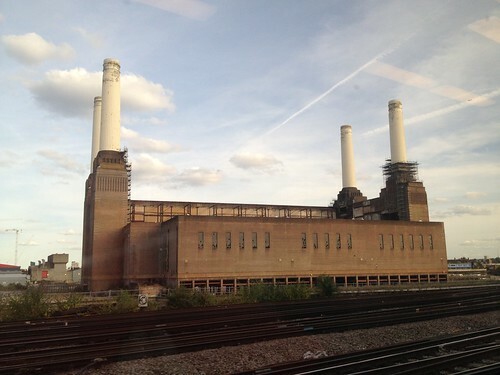 En route to Gatwick Airport I snapped this photo of the iconic Battersea Power Station. It’s been a lovely few days but I was very glad to be back in my own bed!